There is no medical test to diagnose autism. Autism is usually considered a spectrum condition where individuals can fall on different ends of the spectrum usually driven by severity. This is a bit of a blinkered viewpoint in the ones severity of disability can be viewed differently by different people. There is a large debate within the autism community about severity and what and who is deemed to be more severe, which makes me ask; is Dylan severe? It’s true that he is severely affected in that he is unable to speak but he has great sense of humour and is able to prepare and plan for change with relative ease to be considered ‘severe’. There is a lot of time spent with people including those with autism or their parents or care givers, arguing as to where they or their loved one should be place on the spectrum. The reality is that due to Dylan’s lack of speech and the adaptations that Mark and I make to enable Dylan to get through the day would probably place Dylan as among the severe type of autism, a low functioning, almost Kanner type classical autism; think Rain Main but without the card counting ability. However with time and extensive help Dylan is able to integrate and progress – does this make him less severe or is he just working harder to ‘fit in’? Stripping back the debate the cause of this disagreement is the theory of the autistic spectrum being complied of three main areas of difficulty which is known as the ‘Triad of Impairments’. Some individuals with severe autism may never develop any speech whilst those with higher functioning autism may speak fluently, using full sentences. For all people on the spectrum it is the ability to use their communication skills that is impaired, this covers the processing of language and interpreting facial expressions, body language or tone of voice. •	understanding figures of speech or metaphors such as “she bit my head off” or ‘pick your feet up’ when shuffling can be confusing and even frightening. Sarcasm and humour are also considered misunderstood. •	There may be a marked difficulty in following long or complicated sentences, and only being able to follow maybe one simple instruction at a time. Communication is often an area of difficulty for individuals with higher functioning autism even though they may appear to have good verbal skills. •	Problems in explaining how they feel. Some people repeat the last word of a sentence when asked a question. Dylan often does this and will make an incorrect choice when given options – we always have to check that he means what he says when he answers. Others may say things more than once; often out of context this is called echolalia. A person with classic autism may appear withdrawn, aloof or uninterested in others and have difficulties around social relationships. The ability to develop friendships is generally very limited. People with higher functioning autism also have these difficulties, but seem to be more aware of them. They may want to make friends and be a part of society but are awkward or clumsy in social situations. •	Avoiding eye contact (because they cannot process the information overload of speech, facial expression and body language). •	Standing too close when talking to someone – unaware of personal space. •	Not realising when the person they are talking to is cross or tired. •	Laughing or speaking at inappropriate times. •	Showing no interest in other people’s opinions or interests. These behaviours are often taken as a sign of rudeness which further affects the ability to socialise. Social imagination allows the understanding and prediction of other people’s behaviour, to make sense of abstract ideas, and to imagine situations outside our immediate surroundings. •	Imagine the world from someone else’s perspective and understand that other people may have different thoughts and feelings from their own. •	Interpret other people’s thoughts, feelings and actions. •	Understand the concept of danger, for example that running on to a busy road poses a threat to them. •	Engage in interpersonal or imaginative play, unless it is something they have copied, in which case they often pursue this rigidly and repetitively. •	Prepare for change and plan for the future. •	Cope in new or unfamiliar situations. 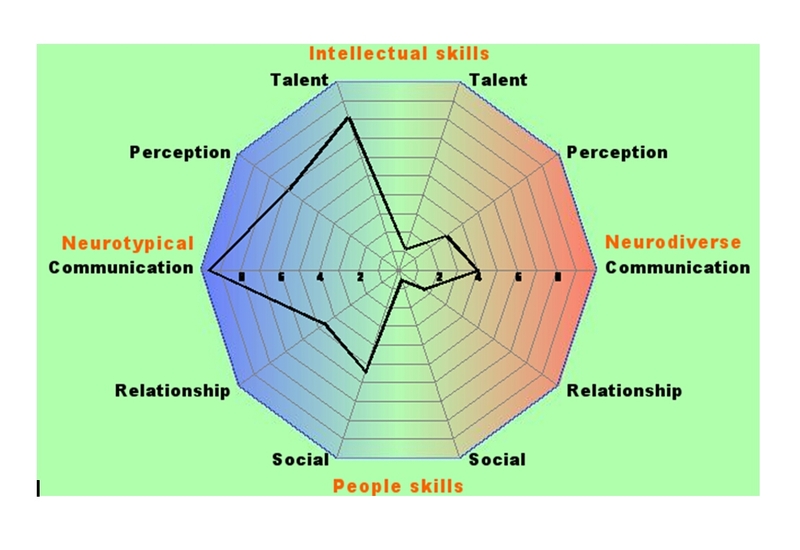 It’s my opinion that is that autism is not a two dimensional disability of either severe or mild, I would suggest that we move beyond categorisations of high and low functioning and instead focus more on the individual traits and their relative severity for the individual concerned. This produces more of a star interpretation of strengths and difficulties, rather than the straight-line spectrum description of high/low functioning, which could demonstrate much more of an all-round picture of someone’s abilities. Which can be used to see the differing elements that can indicate social and communication difficulties present in those with autism. I have attached my results as an example below. I tried to formulate one for Dylan but as I had to guess a lot of his answers this caused his results to be too inconsistent to create a profile for him to demonstrate the difference between us; But you get the gist. Individuals with autism are too individual to be categorised and placed on a basic line of severity, rather we should use star diagrams to highlight areas of strength and celebrate the complexities that differences bring.